Welcome to Napa Valley Care Center. Napa Valley Care Center is proud to be a Medicare-certified, short-term rehabilitation and skilled nursing home located in Napa, California. 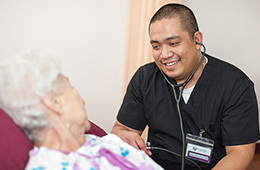 We provide compassionate and personal skilled care 24 hours a day. We specialize in providing rehabilitation services onsite to help our residents regain their independence and return to their homes. We are a skilled nursing facility that offers short-term rehabilitation and advanced medical care for patients whose stay ranges from a few days up to several weeks. We also offer longer term care for residents whose stay is more indefinite. We invite you to stop by for a personalized tour of our facility and our 1,000 square foot, fully equipped, modern gym. Experience for yourself our commitment to excellence.